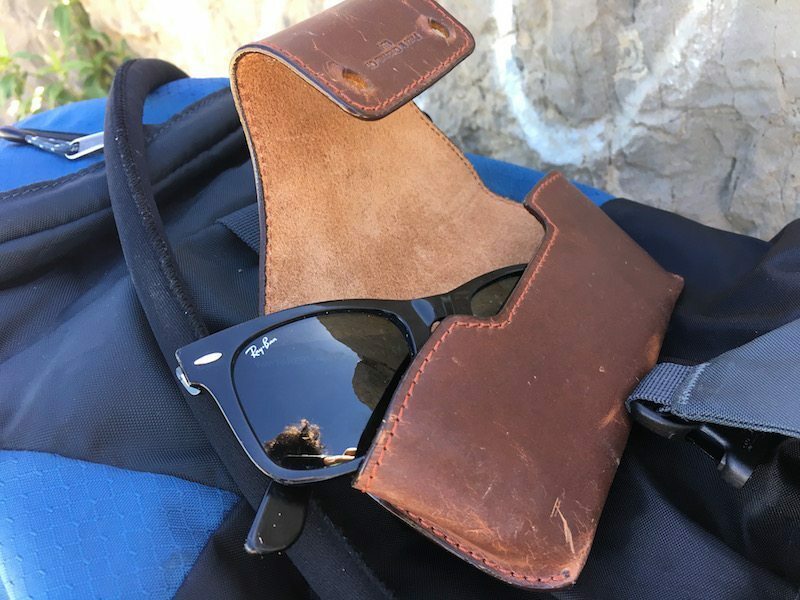 We’ve reviewed a lot of great and varied leather products here at BestLeather, but, somewhat surprisingly, this is the first sunglass case we’ve ever seen! Brookes and Hyde’s Burnt Amber Sunglass Case is a great first entry into this category, made with a gorgeous Horween Bandit pull up leather and utilizing a unique wrap-around closure design. Connor Sambrookes started Brookes & Hyde as a senior thesis project. Hoping to design shoes, he began work for a company designing products for some of the biggest names out there. It was at this job the opportunity to apprentice under a highly experienced leather craftsman came about, leading to creating his own products and founding the company. Today Brookes and Hyde continues as a one man show with big aspirations. Each product is handmade and has a personal touch reflective of its artisan: colors are named for favorite craft beers, and “Cincinnati, Ohio” is stamped on each item in homage to its origin. By sticking to the principles and passions that built the foundation, Brookes & Hyde intends to become a well known name in the industry. The entire case is made with reasonably thick but very soft Horween Bandit leather, with brass closure studs (leather and studs are offered in various colors). Edges are machine sewn with bonded nylon thread, and are given a high-gloss, painted finish. The inner leather is unfinished, with a soft suede-like feel. No rigid structure is used, but the pocket is folded and sewn such that a space is created for sunglasses. Construction is overall top-notch, with no noticeable irregularities. This case should last a lifetime. This sunglass case is both a pleasure to use and a great way to add some protection to your favorite pair of sunglasses. I’m a huge fan of the wraparound closure design. I’ve never been a big fan of snap closures on most sunglass cases (mostly because they often end up tearing the cheap faux leather the case is made with), so the stud closure is a refreshing new take. Pulling the case open and even closing it is done easily with one hand with no strain on the leather. The obvious tradeoff with this case is that there isn’t a rigid structure inside, so there’s somewhat minimal crush protection. The upside is that the case remains soft to the touch and pliable, fitting in smaller spaces, and provides all the scratch and drop protection you could need. This sunglass case should fit most styles of sunglasses easily. It’s a bit roomy for my Wayfarers, but I’ve never worried they’ll fall out. Also, while certainly unintended, I’ve even found this sunglass case to be a great protection for my iPhone 6s, in a pinch! 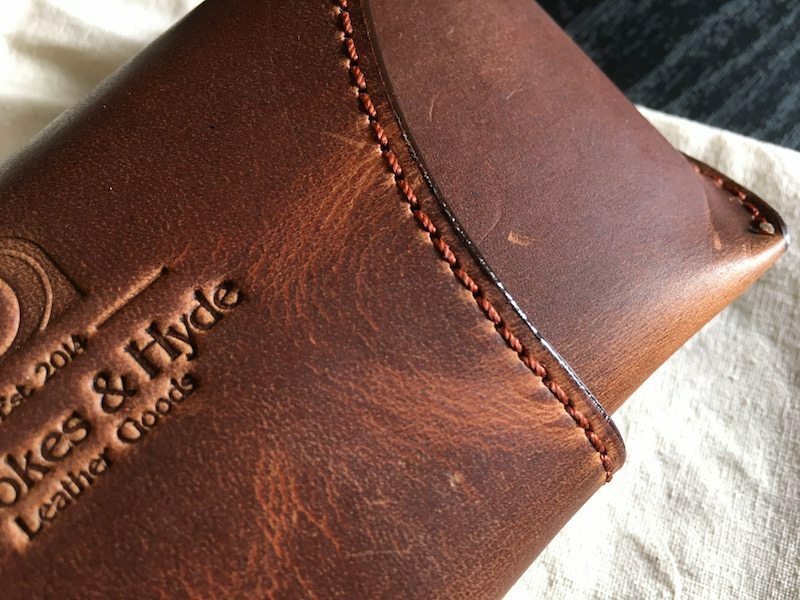 Brookes & Hyde’s Sunglass Case definitely travels in style. The Bandit leather has some absolutely stunning distressing right from the start, and since it’s a pull up leather, you can quite literally customize the look to your liking. I gently crinkled my case in my hand when I got it to create some killer distress lines around the edges. If you don’t like the changed colors, create a bit of friction by rubbing the leather with your thumb, and the original brown color returns. The overall aesthetic has a rugged feel, with the distressing adding an asymmetric and irregular beauty. My sunglasses have enjoyed the protection of the Brookes & Hyde Burnt Amber Sunglass Case, and I’ve enjoyed using it. 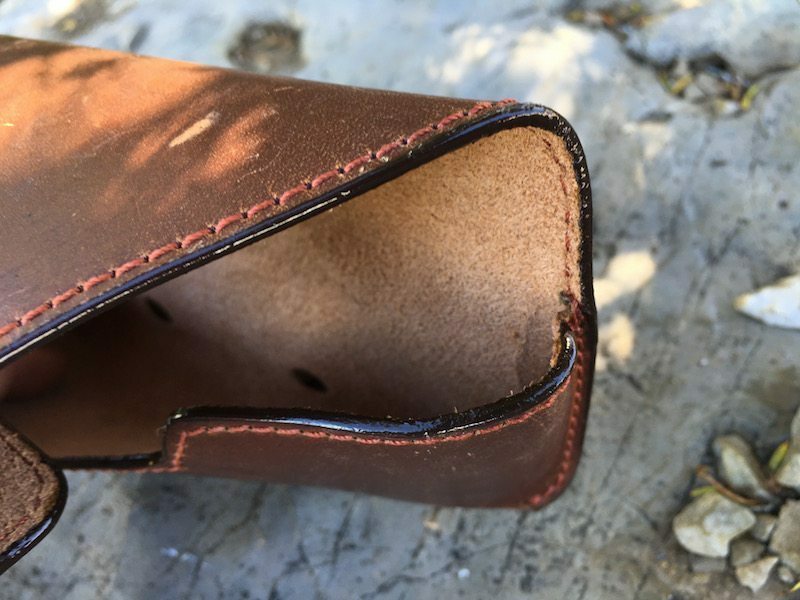 The pull-up leather is beautiful, and the wraparound design is refreshingly unique and easier to use than standard snap designs. I highly recommend this case as a Buy It For Life product. 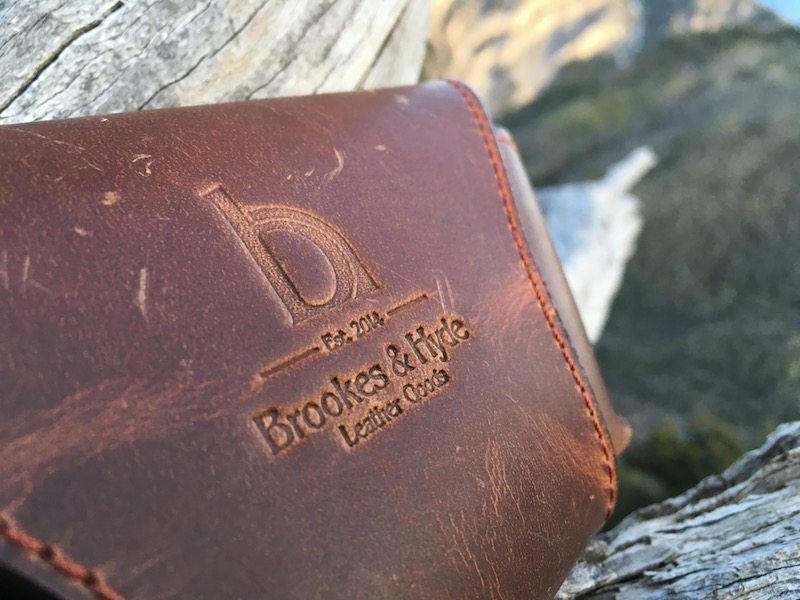 Be sure to swing by Brooke’s & Hyde’s shop and check out the Burnt Amber Sunglass Case and their other great leather goods. 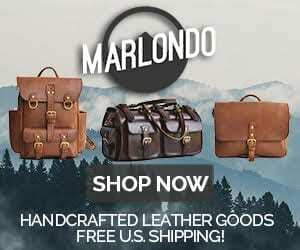 2 Comments on "Brookes & Hyde Burnt Amber Sunglass Case Review – $70"